My family and I are always open to new adventures, we all share the same love for the outdoors. During the summer we always find new adventures and there is always something to do with the kids, but something about the winter always keeps us indoors. I hate seeing the girls glued on to the electronics and annoying me every five seconds that they are bored. 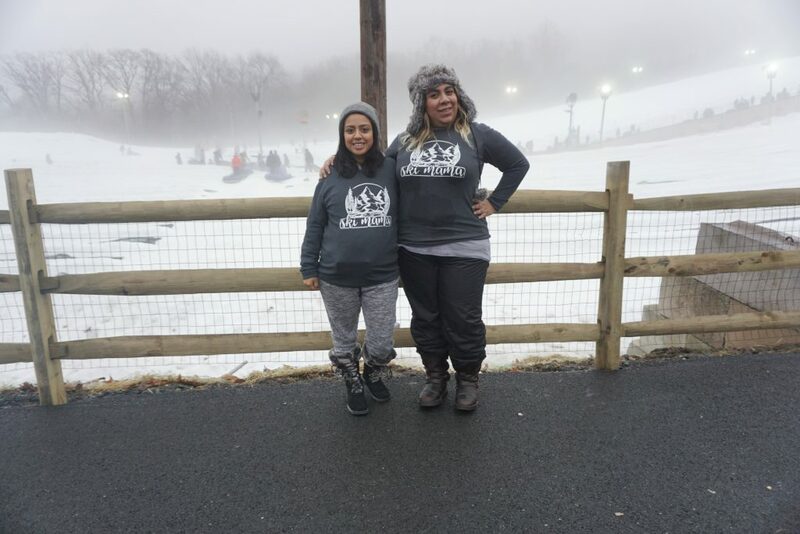 So last weekend we packed up the car and headed to CamelBackResort in the Pocono Mountains. Being that I am 7 months pregnant, it did not stop me. I was up for the challenge and I really wanted my family to have a great time and enjoy this new experience. First things I packed all their essentials, and we headed to mountains. Driving from Northern NJ, was really not that bad. We drove for an hour and a half, and the drive to CamelBackResorts was so beautiful. 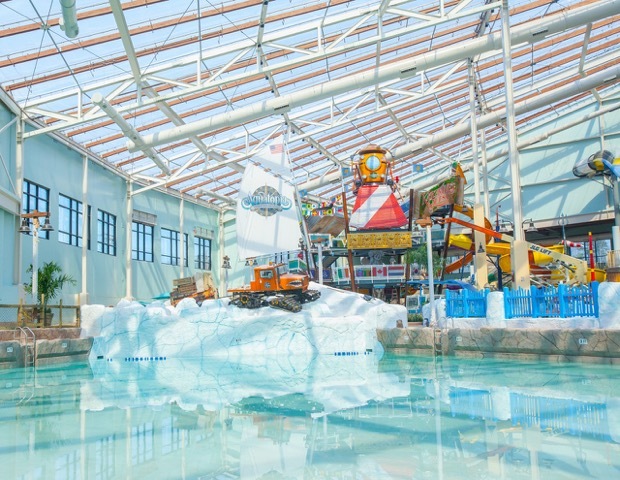 Camelback Lodge & Aquatopia Indoor Waterpark is located at Camelback Resort just 90 minutes from New York City and two hours from Philadelphia in the Pocono Mountains at 193 Resort Drive, PO Box 168, Tannersville, PA 18372. 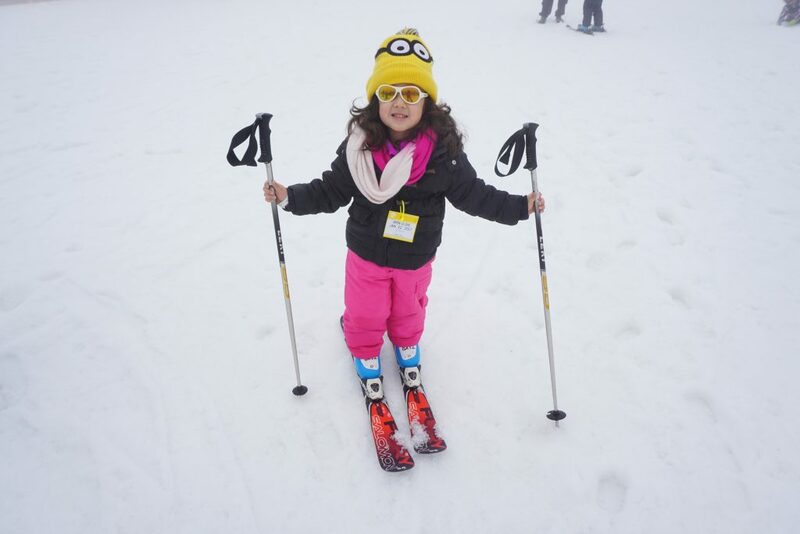 CamelBack Resorts offers Kid Lessons for beginners, which was awesome because Kayla was able to build her confidence and endure the sloops. There are three programs for your child, Kids Half-Day Lessons, Kids 90-minute lessons and Kids Private Lessons. Henry needed some help as well, as this was his first time he was feeling a little nervous. He started out really nervous and had a couple of falls, but after getting help from the instructors he build his confidence and rode down the bunny slope. Skiing for little ones, is a serious challenge. I would recommend skiing lessons for 3 year olds as well and if I could do it again I would have sent Annalee to lessons too. While we waited around for the lessons to finish, Annalee and I practiced Skiing around the small hills. It was her first time, and she did great! 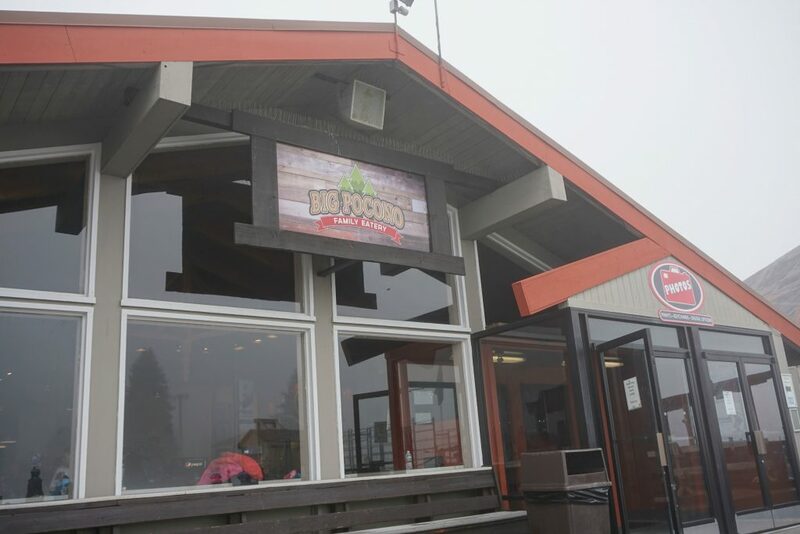 The Big Pocono Eatery was conveniently located in the area where we were Skiing. Offering great selections,those with dietary requirements and allergy concerns. I am gestational diabetic and their was really lots of options for everyone. 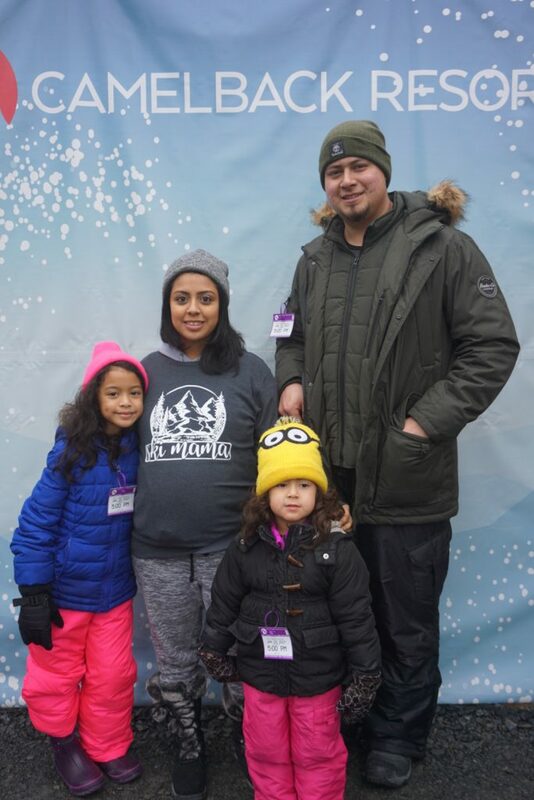 The family really had a blast at the CamelBack snow tubing lodge. Camelback is home to the Biggest Snowtubing Park in the U.S.A and their new laser & LED lit Galactic Snowtubing begins at 5:00PM each day. While the family was sliding for almost two hours, I took this time to sit back and enjoy the time alone. In the family waiting area there is a cozy fire pit and also a waffle snack house that had hot chocolate that smelled delicious. 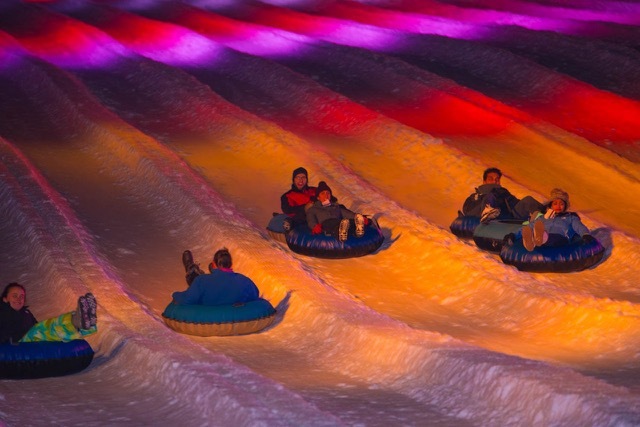 Galactic Snowtubing launches daily after dark. 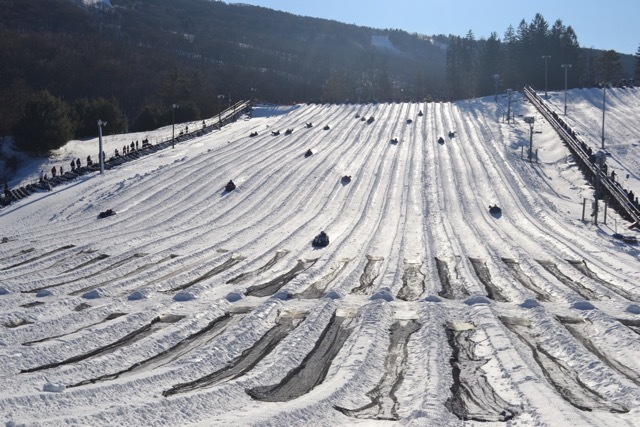 Snow tubing tickets are only available for purchase at the Camelback Snowtubing Park on the day of your visit. They are sold on a first-come, first-served basis. Snowtubing tickets are not available for sale online. What can I say, the Aquatopia Waterpark was my favorite! Being pregnant I found the water super relaxing. They offer attractions, rides, and slides. Thirteen slides, Seven pools, including a wave pool, an indoor/outdoor spa whirlpool, a lazy river and a toddlers’ pool. The waterpark was really appealing with colorful lights, clean water and restrooms. Changing rooms and lockers are available inside Aquatopia. Cabana rentals are available on a daily basis from open to close of the indoor waterpark. Aquatopia Waterpark free with your stay! My shirt speaks for itself, I am officially a Ski Mama! Our first experience was beyond what we expected, and I am so excited my family and I have found something new to do during the winter months. I cannot wait to start new family traditions and explore new adventures. Watch the Vlog from our trip! FTC:A huge Thank you to Momtrends and CamelBackLodge for making this trip possible for my family. I was provided free tickets for review purposes only. All opinions expressed here are my own. 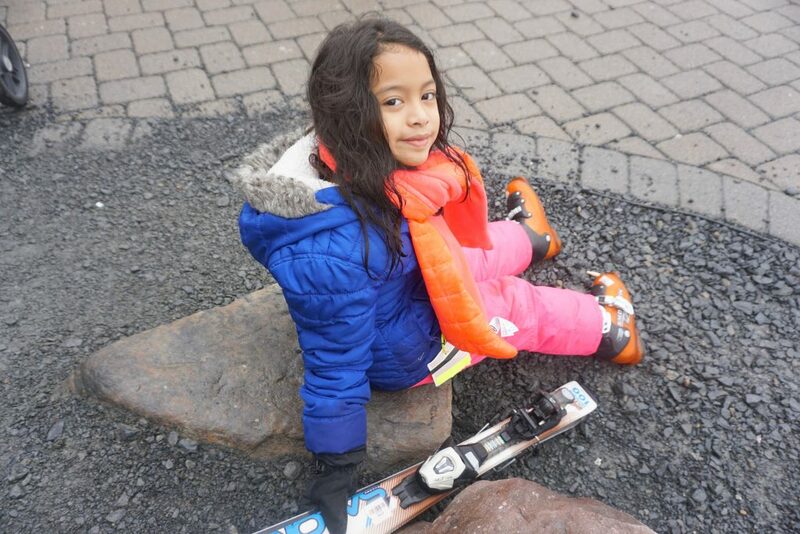 One Response to "Family Skiing Trip & fun at CamelBack Resort! 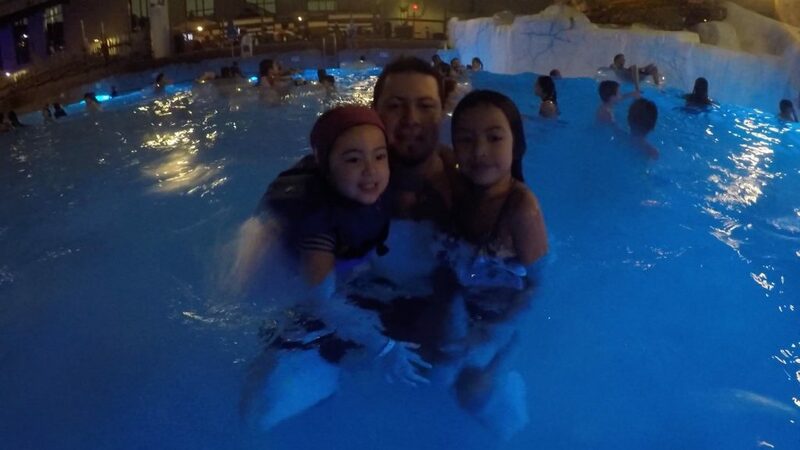 @camelbacklodge #MTCamelback"
Now that looks like some seriously fabulous family quality time! The ski lessons were clearly a big hit for everyone who took them. 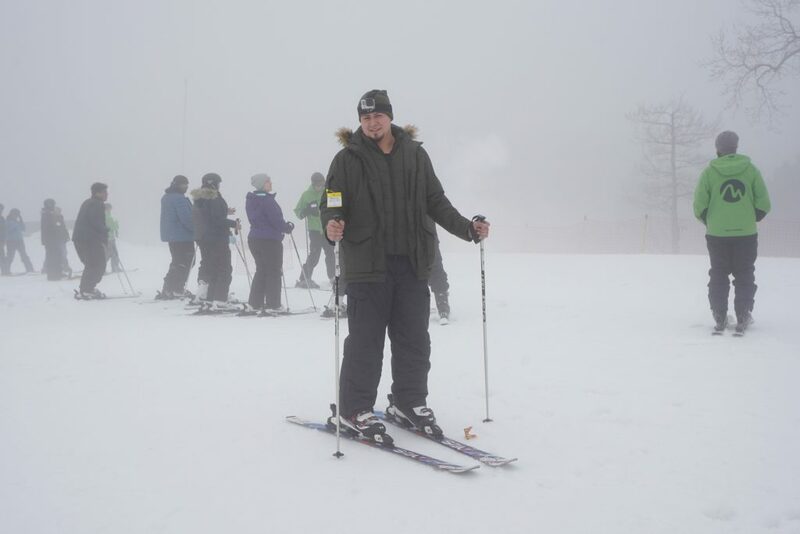 Feeling confident on those skis makes time on the slopes so much more fun!